Walter P. Reuther was one of America’s great labor leaders. He was also living proof that one person can make a difference. Reuther was president of the United Automobile Workers union (UAW) between 1946 and 1970. Under his leadership, the American and Canadian members of the UAW obtained their fair share of the enormous wealth they produced and were able to restore dignity to the industrial work they performed. Reuther’s work, however, went well beyond contract negotiations and union organizing. Reuther believed that the labor movement was a social movement, that unions had the power to improve the lives of all working-class Americans, and the potential to change the world for the betterment of all. 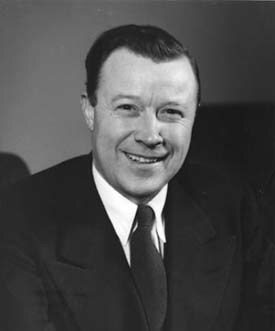 As president of the UAW, Reuther supported the civil rights movement, environmental causes, public housing projects, and health care improvements. He also promoted international relations and political reform at the local, state and federal levels. Indeed, Reuther’s intellect and ideas shaped modern America. He meets all of the criteria necessary for greatness, and this web site has been established in his honor, as the UAW and the Walter Reuther Library celebrate his 100th Birthday. This web site is devoted to the history of Walter P. Reuther and his accomplishments. It is a creation of Reuther’s namesake, the Walter P. Reuther Library of Labor and Urban Affairs at Wayne State University in Detroit, in partnership with the Wayne State University’s Library and Information Science Program.